A well designed patio within or extended past the house lines can open up large areas for outside enjoyment. It can encompass BBQ and spa areas and provide an outdoor feel while still sheltering you from the elements. 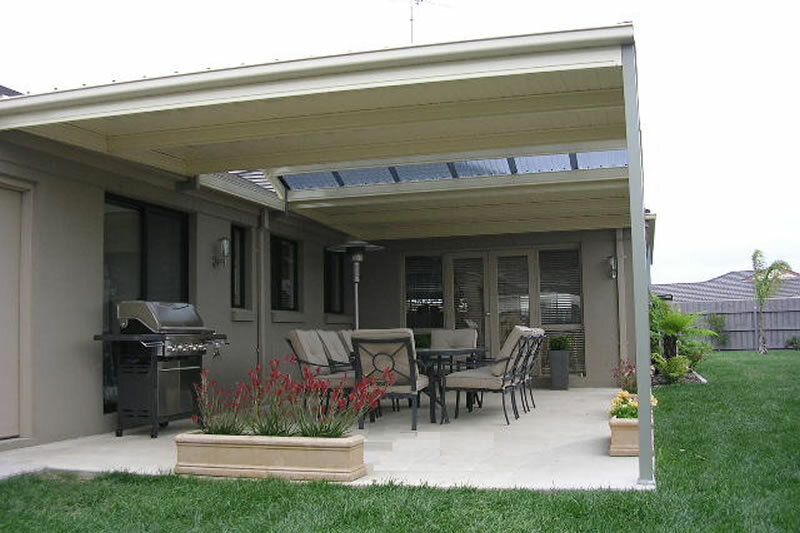 We at Gimme Shelter have had many years of building patios in coastal environments as well as all areas of Geelong and surrounds. We know both materials and workmanship make all the difference and we pride ourselves on delivering both. We also know that any patio design must compliment your existing building. Let us help you to decide what will both suit your needs and look stunning at the same time. Gimme Shelter are also experts at dealing with councils and will endeavour to make even this aspect of your patio project as painless as possible. Using the combination of a Gable into a skillion roof design is an efficient way of weather protection. For example, this north facing Ocean Grove Patio, allows for maximum sunlight through the open gable end. While the lower skillion roof, protects against strong winds and rain, typical from the south west. 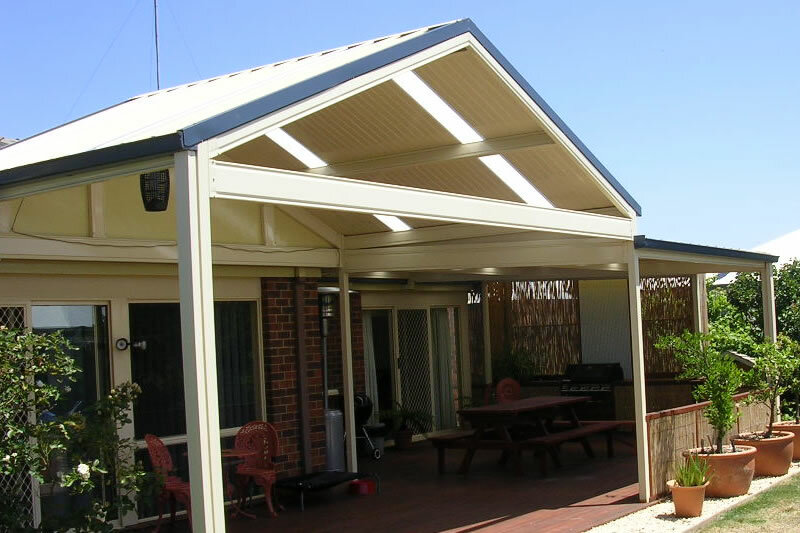 This free standing pergola/patio consists of a Colourbond frame and a Solarspan roof. Solarspan is a relatively new roofing product that is becoming increasingly popular. 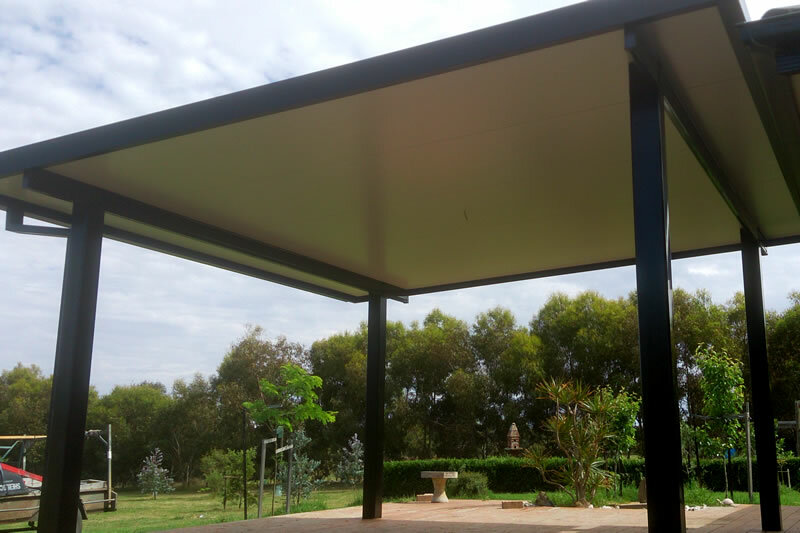 Solarspan is constructed using a rigid polystyrene core with a Trimdeck roofing profile on top and a completely flat underside which can appear almost identical to a standard ceiling you would find inside your house. Solarspan can also span incredible distances whilst still being trafficable. This Solarspan structure recently built in Wallington spans 6 meters between rafters with a 600mm eve over hang each end. Another Gable into Skillion design, this time attached straight to the residence. The selection of a double sided colourbond roof sheet efficiently reflects sunlight let through by the clear Polycarbonate on the Gable roof. Leaving both of the Gable ends open maximises airflow.